Welcome to Hooked on Cycling Holidays and our cycling holiday in Istria. This biking vacation in Istria is a wonderful guided bike tour by bike and boat. Stunning cycle rides during the day and relaxation on your floating hotel at night. What makes this type of holiday wonderful, is that if you do not cycle or do not wish to cycle you can stay on board and soak up the sun. The heart of Europe is what the Istrians call their peninsula, inspired by its shape and its position at the crossroads of European arteries, cultures and nations. This is where Central Europe and the world of the Mediterranean meet. On this tour, we will explore the most popular part of this Croatian coast. Starting in Pula our tour guides will show us the most beautiful routes of the whole coastal region. We’ll visit the Lim channel with its caves, the coastal cities Porec, Rovinj and Pula, as well as the Istrian hinterland, a famous wine and truffle region. Day 1 (Sun) Pula – Pula 12 miles 20km. Individual arrival at Pula. The secret capital of Istria with its town full of impressive remains of its Roman past awaits your visit. Between 2 and 2:30pm check-in on your boat. Our first cycle tour starts at 3 pm and takes us on a circular route around Pula and back to the ship. You might get the chance to havea closer look of the famous Amphitheatre. Once your cycle tour is finished, you go on your first cruise just a couple of miles north to a quiet bay for your overnight stay. Day 2 (Mon) Vrsar – Poreč 22 miles 35km. We make our way on a very scenic, approx. 3 hour cruise to Vrsar, the town where lady killer Casanova found temporary refuge from lovers pursuing him. Starting from Vrsar, we cycle along the Lim fjord to Klostar. Take a break; long enough to taste some fresh suckling pig, we cycle to Poreč. On a guided walk, we encounter the evidence of the town’s eventful past at every step along the way. While strolling through the charming historical centre, with its beautiful buildings of many different periods as well as the bustling shopping lanes, we will not miss the famous Euphrasian Basilica, with its gorgeous early Christian mosaics. Day 3 (Tues) Poreč – Višnjan – Umag 31 miles 50km. Today’s cycle tour takes us from Poreč through extensive vineyards to Visnjan, home of the famous white Boskarin-Cattle. After a coffee break, we continue cycling through the gentle hills to Vizinada. After a lunch break, we cycle back to Poreč. We will not miss to visit Baredine Cave on our cycle tour. Our excursion takes us through five amazing halls which are beautifully illuminated. It leads us 60m under ground to a subsurface lake and if we are lucky we’ll meet a native – the famous amphebia (Proteus anguinus): the olm. This little cave dweller is a unique one. It is endemic to this karst area. Back at the ship we hop on our boat and enjoy a lovely cruise to Umag. Day 4 (Wed) Umag – Grožnjan – Novigrad approx. 34 miles /55 km. After breakfast, we start our cycling tour to the north starting at the headland and further on along the coastline. After a climb, we get to the artist’s village of Grožnjan. After a long relaxing stop, we continue cycling to Novigrad passing the river valley of Mirna. The Mirna river valley is well known as an area where white truffles can be found. A gourmet’s heart will jump of joy. Getting to Novigrad we find the impressive battlement of the city wall as well as the 7th century Pelagius Basilica. Around the pretty harbour, we find many cafes and bars, where we can end the day. 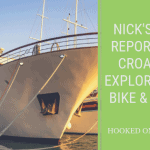 Day 5 (Thu) Novigrad – Poreč- Rovinj approx. 22 miles /35 km. After breakfa,st we leave Novigrad and cycle along the coast all the way to Poreč. There is time to take a stroll through the beautiful old town and to enjoy the regional cuisine for lunch. The boat awaits you in the harbour of Poreč and will take you into the direction of Rovinj. Day 6 (Fri) Rovinj approx. 12 miles / 20 km. Hopefully last night you enjoyed a little time Rovinj, which really is an gem of a town. After breakfast, we start our cycle tour which allows ample time for a refreshing bathe in the Adriatic Sea. Rovinj has so much to see so this afternoon we are back in the town where you can stroll through the winding alleyways of this picture-perfect town. It’ll leave you enchanted. Day 7 (Sat) Rovinj – Barbariga – Vodnjan – Pula approx. 22 miles / 35 km. A longer crossing takes you to Barbariga. We get ashore, have some lunch and hop on our bikes. Our cycle tour leads us via Vodnjan back to Pula our port of departure. There is enough time to take a walk through the town and to visit the many heritage sites which the city has to offer. A celebrative evening meal with guests, guides and crew brings a fantastic week to a happy end. After breakfast individual trip home. With its dark green painted hull and the white stripes, the Tarin is in each port an eye catcher from afar. Completed at the beginning of the 2004 season, it is the one of newer ships in the fleet. The furnishings of the cabins attest to the care, that captain Nevio put into the building of his ship. Bright wood, curtains at the large windows and the nicely furniture cabins will immediately make you feel at home on the Tarin. The ship has 10 cabins. Four cabins have a French bed (140 cm) and a single bunk. Two cabins are equipped with a French bed (140 cm). The five remaining cabins have two bunks, which are arranged one above the other or next to each other. Pula – distance: 15 minutes – individual taxi transfer. Collected transfers are on request / the mentioned price is only valid if booked at time of booking and by at least 2 people, to be paid locally in Euro’s.